In the interest of helping Dublin, Ohio visitors learn more about popular local family friendly eateries (and good deals), we periodically feature guest posts by Dawn Scheurle, creator of the popular site: www.kidseatout.com. This is part one of a two-part post on great local patio dining. Oscar&apos;s ~ Two tiered, patio and deck seating, on N. High St. in Historic Dublin. You get a little traffic noise, but the quaint downtown setting and street-side, trendy feel all make up for that. 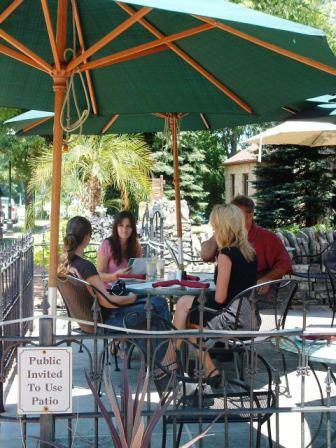 Tucci’s ~ Wonderful patio, umbrellas over every table. Also located on N. High St., but nicely separated from the street by the sidewalk and landscaping. Cabo Cucina ~ It would be tough to beat this patio. It is located behind the restaurant along the Scioto River. You can’t see the river while seated but the stone walls, landscaping, and natural surroundings takes you to a whole new world.... one you may not be ready to leave once you’ve found it! El Vaquero (Shawnee Hills location) ~ We loved this patio before they upgraded it! Now it is fully covered with open walls that can be closed if the weather demands it. Very nice. Matt The Millers ~ (Located on Avery-Muirfield Rd.) There is a pond side patio on the east side of the building, so on hot nights you get the shade of the building. You get a little Avery Rd. traffic noise, but you won’t notice it much as you sip your wine under the umbrellas! Luce’s (Powell) ~ Flowers + wrought iron + umbrellas = lovely. The patio is on the parking lot, but it’s not a busy one so it’s not much of an issue. It’s a little drive from Dublin, but we like it so much we thought it was worth the mention! J Lui’s ~ It’s on Bridge Street (in Dublin&apos;s Historic District) so there is a constant flow of traffic nearby, but just remember that everyone driving by is very jealous -- wishing they were the ones dining on the patio! Montgomery Inn ~ A little more formal than most patios because it has a full roof with closable walls so the tables, chairs, and decor can be more ‘inside’ style. It’s view from up on the hill is very pretty and we love the stone fireplace. Digger and Finch ~ You wouldn’t know you were on Riverside Drive. This is a large patio located between the gorgeous stone building and the driving range. A relaxing getaway. Dublin Village Tavern ~ In the heart of Historic downtown Dublin, this is a great casual outdoor patio. It fills up fast so get there early to get a seat! Vittoria’s ~ (In Powell, OH) Offers one of the prettiest patios around. It is on the parking lot, but they have done a beautiful job of separating it with wrought iron trellises covered with climbing, flowering, vines.